We would like to invite all of our fans to the 80th annual meeting of the Society for Pennsylvania Archaeology. The meetings are being held at The State Museum of Pennsylvania April 3 thru 5th; and this year's theme is the archaeology of Penn’s Woods. Presentations will include topics from the Paleo-Indian period, 11,000 BP thru the historic era. There will be a special Saturday afternoon session from 1:00 PM – 4:30 PM covering the French and Indian War period in Pennsylvania. Students from Susquehanna High School will be displaying their poster’s dealing with forensic anthropology a.k.a. Crime Scene Investigations. Saturday evenings’ banquet speaker is Bruce Bomberger, curator at Landis Valley Farm Museum presenting his research on his publication "The French and Indian War in Pennsylvania, 1753-1763". The presentations will continue Sunday morning and include six presentations on early Native American farming communities in Pennsylvania. The Society for Pennsylvania Archaeology was formed in 1929 by the Pennsylvania Historical Commission to promote the study of prehistoric and historic archaeological resources of Pennsylvania and neighboring states; to encourage scientific research. Avocational and professional archaeologists come together to learn about currant research and preservation of archaeological sites and artifacts. 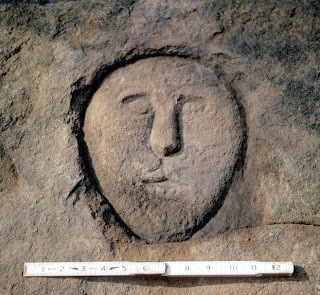 This sandstone petroglyph, collected from Schuylkill County, PA, is believed to represent Mesingw or "Living Solid Face." Discovered by Francis Burke of Schuylkill County in 1971 and subsequently recovered by the State Museum, this glyph is thought to represent Mesingw. An important Lenape spirit being who rode through the forest on the back of a large deer, Mesingw is believed to have made sure that all the animals were healthy and fed. Lenape hunts were likely to be more successful if Mesingw was remembered. To see additional information on other petroglyphs in Pennsylvania visit PAarchaeology.state.pa.us or search "Pennsylvania Petroglyphs" on YouTube for our videos. 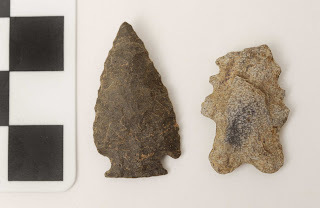 These two projectile points were unexpectedly recovered from excavations at the Fort Hunter site, located just north of Harrisburg. This project is being conducted by the Pennsylvania Historical and Museum Commission and the goal is to locate the remains of the French and Indian War era supply fort that was at this location between 1757 and 1763. Numerous 18th century artifacts and features have been recovered and some of these may be part of the fort occupation. However, the stockade and the blockhouse have yet to be located and our investigations are continuing. Both of these artifacts date to the Early and Middle Archaic Periods and were probably propelled using an atlatl or spear thrower. The one on the left is classified as a Palmer type. This specimen is made of chert and this style is distinguished by its “Christmas tree” shape, small corner notches, small serrations and grinding on the base. When found at other sites, it has been consistently dated by carbon 14 methods to between 9800 and 9200 years ago. The projectile point on the right is classified as a St. Albans type. It is made on rhyolite that was quarried from the South Mountain area of Adams and Franklin counties. When found at other sites, it has been consistently dated by carbon 14 methods to between 8900 and 8300 years ago. These were used as spear points in hunting. Although there are many other prehistoric tools representing later periods, these two artifacts are the oldest thus far recovered from the site. They document how this location has been visited over a period of almost 10,000 years. The confluence of two streams was a favorite camp site for Native Americans and this is situated at the confluence of Fishing Creek and the Susquehanna River. It is no surprise that this site was continuously visited by Native Americans throughout prehistory. Further, the same characteristics attracted the first Europeans and this site was occupied as early as 1740 during historic times. Both of these projectile points were found close to the surface and in an area of the site where the sediments are thin and not well stratified. The 2008 excavations exposed an area closer to the river where the soil is over four feet in thickness. This suggests that these earlier occupations may be found buried under the fort artifacts. This excavation takes place as part of Pennsylvania’s Archaeological Month celebration in September and October. We will continue the excavations in 2009 and we encourage the public to visit. For more information on Fort Hunter or the prehistory of the Susquehanna Valley, visit PAarchaeology.state.pa.us or the Hall of Anthropology and Archaeology at The State Museum of Pennsylvania . The vast majority of archaeology conducted in the United States today is a direct result of the passage of the National Historic Preservation Act of 1966 (NHPA). This law requires Federal agencies and development projects receiving federal funds or permits to make a “good faith effort” in identifying and preserving historic resources that may be impacted by construction activities. Once identified, historic resources are evaluated for significance, in terms of their eligibility to the National Register of Historic Places. Often, archaeological sites are identified in the survey phase of a project only to fall short of the threshold of significance in the evaluation phase. Typically, an archaeological site is deemed eligible only if it has contributed or is considered to have the potential to contribute new information about the about the past. Artifacts and the associated records for sites determined not to be eligible to the National Register are still curated at the State Museum of PA to document that the project sponsor has fulfilled it’s obligations as required under Section 106 of the NHPA. 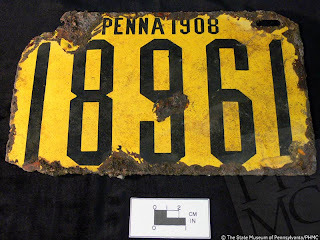 The 1908 Pennsylvania license plate pictured here is one artifact recovered from the survey phase of archaeological excavations conducted prior to improvements to Route 219 in Johnstown, Cambria County, PA. Due to the disturbed nature of the soil deposits in the project area, this site lacked integrity and no further work was recommended by the consultant, Heberling Assoc., Inc., and the State Historic Preservation Office concurred with this finding. Significance might seem like a fairly subjective term. What one person considers significant another person might not. In fact the NHPA outlines four criteria for eligibility to the National Register to standardize the definition of “significant”. While it has been determined to be historically insignificant, one could argue this object still has value as an artifact with the powerful ability to visually connect us with over a century of automobile history in Pennsylvania and can act as a platform for a wide range of related inquiry.